Normal is the true story of the author’s survival and recovery from a ruptured cerebral aneurysm. It poignantly and humorously addresses dealing with altered self-image, finding ways around barriers, and appreciating the play of serendipity and synchronicity in our lives. The book is a moving and sometimes hilarious account of her determination to reconnect with reality and construct an active, rewarding life in the aftermath of a traumatic event. Sharing skirmishes and victories, Janet Bettag conveys a message of hope, inspriation, and support to her readers. In doing so, she reminds each of us that we have a choice to make when faced with adversity - remain a victim or become a warrior. Tricia:. Welcome, Janet. Thank you so much for joining us. Before we talk about your book, can you please tell my readers about yourself? Janet: I’m a Missouri native, born in Pike County and raised in Florissant. Aside from the three years spent in Michigan’s Upper Peninsula while my husband was stationed there in the Air Force, I’ve lived in Missouri my entire life. Writing has been an important part of my world since I was a child. I think I was about 10 years old when I undertook writing a monthly newsletter for a youth group. In high school, I was a reporter and editor for our school newspaper, was co-editor of our senior yearbook and did quite a bit of creative writing – even had a few things published in a local literary publication. For many years, I focused on my family and making a living as an administrative professional – which involved writing everything from routine correspondence and client newsletters to press releases and annual reports. I recently retired from that career so I could devote more time to my personal writing projects. When I’m not writing or doing something related to that, I’m most likely either in the kitchen or working in my gardens. I love spending time with my family – especially if it involves an opportunity to do fun things with my granddaughters. Tricia: Describe the day leading up to your aneurysm. When did you first realize something was wrong? Janet: Aneurysms are sneaky little rascals. They rarely give their victims any warning. When they are symptomatic prior to rupture, the indicators may be visual disturbances or headaches. Unfortunately, such signs are often attributed to less life-threatening causes such as migraine. I didn’t realize anything was physically wrong until I had a stabbing pain in my left temple and within seconds I lost consciousness and went into grand mal seizures. Eventually I realized that about a week prior to my bleed, I was bothered for several days by a dull ache at the base of my skull, which I assumed was nothing more than a stiff neck from sleeping in an awkward position. Was it a warning sign? I guess I’ll never know. Tricia: In terms of emotional healing, what was the most difficult challenge to overcome? Janet: An event like I experienced is not only life-threatening, it’s also life-altering. I think all the emotional challenges I faced tied into self-concept. It was difficult to accept that I was not the same person I was prior to the bleed. When I finally realized that something life-altering didn’t have to be life-defining, the emotional healing began. It was a matter of choosing to be a warrior instead of a victim. Tricia: In your book, you talk about the importance of caregivers and a support system. Can you tell us about the people who helped you through your experience? Janet: Oh, my goodness, there are so many people who contributed to my recovery. My husband was my primary caregiver and, of course, my kids were very supportive and encouraging. Extended family, friends, my boss, and coworkers played important roles as well. In terms of my emotional and psychological recovery, my most important support system was a core group of brain aneurysm survivors – we called ourselves The Brain Gang. We met though an online message board and became the closest of friends. I miss those folks and sometimes wish I had stayed in touch with them. With any luck, they’ll hear about Normal and contact me so we can pick up those friendships where they left off. Tricia: You mention serendipity and synchronicity. How have these two words become a theme in your book and in your life? Janet: Serendipity describes those unexpected happy accidents we all experience. Whether it’s running into friends we haven’t seen in decades or something that has a huge impact our lives, serendipitous events occur without our intervention or intention. Synchronicity refers to seemingly coincidental events that are related, but one thing doesn’t seem to cause the other. An example would be having somebody offer you your dream job the same day you learn that the company you work for is downsizing. Things just seem to work out. I believe both are at play in everyone’s lives and can be extremely powerful forces for good if we just pay attention. When my aneurysm ruptured, I was seated in the county courthouse next to a registered nurse. Had I not been worried about being late for the court appearance, I might have been driving in rush hour traffic when I lost consciousness. That particular morning, my neurosurgeon arrived early at his office, which just happened to be a few blocks from the courthouse. There are more examples I could cite, but the point is that everything worked together for the best possible outcome. There were times when I was writing Normal that I questioned whether it was a worthwhile project. It seemed like every time I was about to scrap the manuscript, something happened that convinced me to keep working on it. It was certainly a happy accident that I was introduced to Charles Winslow, the artist who designed the book’s cover – not only because the image he created perfectly captures how I felt after the bleed, but also because he is a truly amazing and inspiring individual. When we are dealing with adversity it isn’t easy to see what good might come of the hardships we have to endure, but I believe everything happens for a reason. Sometimes the purpose is so obscure I have to accept on faith that divine intervention will guide me along the correct path. When I am diligently observant and mindful of serendipity and synchronicity, my life is purpose driven. Tricia: What was your goal in writing this book? Has that goal changed now that you’ve published it? Janet: Writing Normal is my way of reaching out to others whose lives have been affected by brain trauma to offer encouragement and support. While every person’s experience is unique, there are some common challenges. Maybe by telling my experience, I can make somebody else’s life a little easier. I’m not qualified to offer medical advice, so I don’t. But I understand how overwhelming the challenges can feel. Nobody should be alone or isolated in their recovery. I can reach more people with my book than I could ever hope to meet and support personally. In addition, I hope the book raises public awareness of cerebral aneurysms. Shocking as it may seem, an aneurysm ruptures in somebody’s brain every 18 minutes. Approximately 30,000 people in the U.S. are stricken every year. A sizeable portion of the profits from the book are being donated to The Brain Aneurysm Foundation to help fund patient support and research focused on early detection and prevention of ruptures. In addition, I’ve established the Normal Readers BRAINPOWER Team to raise additional funds and I invite your readers to join the effort by making tax-deductible donations directly to the Foundation. My personal goal is to raise $1,000 by September 15, 2013 – which would be one year from the date Normal first became available online. It would be awesome to see the team multiply that tenfold or more. While my initial target audience for the book is brain aneurysm patients and their caregivers, early readers whose lives have not been directly impacted by brain trauma are encouraging wider distribution. One reviewer wrote that Normal deserves to be on Oprah’s list. Java Davis of The Kindle Book Review wrote, “I learned a great deal, and I feel that reading this book has improved me as a person.” If it has that kind of impact on people, I’ve accomplished far more than I set out to do. Tricia: Your book definitely had an impact on me. I found your story to be very inspiring. In your book, you talk about small accomplishments. Writing your book has certainly been a huge accomplishment. Are there other accomplishments that stand out as being significant? Janet: It may seem laughable, but every morning I take great joy in being able to brew a pot of coffee. That may not be my most meaningful achievement, but I find it personally and sensually rewarding. Having helped coordinate the first known conference for cerebral aneurysm patients and their caregivers could be considered a significant accomplishment, and I’m glad I had that experience. However, I want to comment on those small accomplishments I referred to in the book. We tend to take for granted so many of the things we do every day, usually without giving them much thought. For most people, goal setting focuses on tasks or projects related to education, career, or financial security. Yet, there are many for whom simple things like zipping their jeans requires intense concentration. The goals they set may have to do with moving a finger or taking a few steps without assistance. Mastering those skills is as much an accomplishment and as deserving of celebration as my writing a book, perhaps more so. Tricia: Where can other survivors or caregivers go to find help and support? Janet: There are many more resources available today than there were when I was early in recovery. The Brain Aneurysm Foundation is a wonderful source of information and provides opportunities for patient support. MedicineNet.com also offers pretty straightforward information as does the Mayo Clinic website. Many hospitals and some rehabilitation facilities now offer support groups, so caregivers should ask about what’s available locally. The Daily Strength website has a message board-based support group for aneurysm survivors at http://www.dailystrength.org/c/Aneurysms/support-group. That would be helpful to people who can’t take advantage of a local option. I want to point out, however, that this type of support is not to be confused with or taken as medical advice. It is a sharing of personal experiences and each participant’s knowledge will be unique to that individual. Such an environment can be immensely beneficial in terms of emotional support and open communication, but should augment and not replace advice of medical professionals. I encourage both patients and caregivers to be proactive about their care by communicating openly and often with the physicians managing their cases. Caregivers should also look into social services programs that might provide in-home care assistance. Hospital social workers are often well versed on what might be available. Tricia: What other writing projects are you currently working on? Janet: The working title of my current work in progress is Messages from Uncle Myrl. If I stay on schedule the first draft will be completed by the end of November and the book should be ready for to publish by spring 2013. It is a ghostly novel that involves a woman whose dream of rehabbing an old mansion into a writers’ retreat turns into a nightmare. From the moment she sets foot on the property freakish weather, unearthed bones, floating corpses, and other complications hinder her progress. Despite the fact that most of the people in town are friendly and supportive she can’t shake the feeling that they share some secret to which she, as the newcomer, isn’t privy. There are several other levels to the story that I’m not ready to divulge just yet. Let’s just say that readers who expect me to tell twisty ghost stories should not be disappointed. I’ve also been refining a quirky little story about a boy and his imaginary friend. That’s been an interesting project. Somewhere along the line it turned slightly darker than what I generally write. I’ve been doing a little bit of freelance work and a publisher recently asked me to write articles for a trade publication, but I can’t disclose anything more about that project until everything is finalized and the first issue has gone to press. Still in the plotting stage is a series of paranormal cozy mysteries that will revolve around the lives of a rather quirky group of writers. I plan to start the writing on the first installment while Messages from Uncle Myrl is in the edit process. I’m eager to begin work on the series because the characters are fleshing out nicely and are ready to start telling their stories. Tricia: Where can my readers go to find out more about your work, or to purchase a copy of Normal? Janet: Probably the easiest way to sample my writing is to follow my blog where I sporadically post excerpts and deleted portions of Normal, book reviews, short stories, and other random thoughts. I also share on my Facebook author page and on Goodreads. If your readers want to follow me on Twitter, I’m @JanetBettag. My website is under development, but should launch soon. 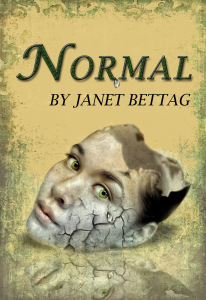 Normal is currently available as an eBook on Amazon, Amazon UK, Barnes & Noble, Kobo, Copia, iBookstore, and eBookPie. There is a paperback version in the works that will be available through local independent booksellers and at book signing events. I hope in the future to place it in hospital gift shops so it will be readily available to families in crisis. I’m also investigating options for a print-on-demand version, which could be ordered online and shipped direct to the purchaser.